If you’re planning your wedding for this year or next, you’ll be facing a glittering array of options. As you’re making big choices about venues and guest lists and smaller decisions like invites and glass hire, one thing becomes clear: the cost can be eye-watering. But thrifty brides and grooms can make a few cost-cutting measures and still create a beautiful wedding. 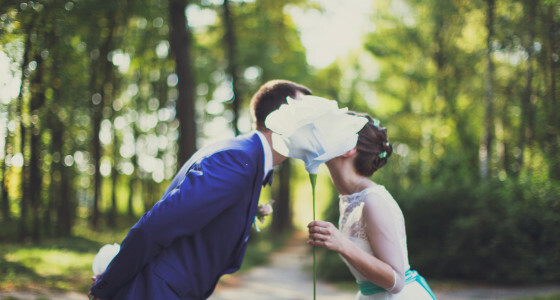 In fact, we reckon these budget-friendly tips may make just your big day even better. As well as being cheaper, handmade invitations are often prettier and more personal than the professional kind. You could practise your calligraphy skills, buy some wooden printing blocks, or create your own collage. There are lots of websites that will print your designs, and many offer an introductory discount. There’s often a queue round the block for these sales and you may only be able to try on a limited number of dresses, but if you’re willing to persevere you can get a designer gown for as little as 20% of the original price. Bear in mind that the dresses are ex-display and usually come in a standard size, so you’ll need to factor in the cost for fitting and alterations unless you’re handy with a needle and thread. Things that are handmade, rustic and vintage are all the rage, so make the most of this and save money at the same time. Keep old jam jars and fill them with flowers for your tables, find an eclectic mix of tea cups in charity shops and use them to prettify your place settings, and try making your own bunting from super-cheap fabric offcuts. Wandering around department stores and wedding boutiques with your bridesmaids tends to be fun for about five minutes, and prices can be astronomical. Shop online instead: trawl websites like ASOS.com (keeping an eye out for sale items), and make a Pinterest board to share your favourite options with your bridesmaids. If the dresses you order don’t fit or don’t look as good in the flesh, you can usually send them back for free. Instead of blowing your budget on a stately home or a hotel, consider renting a beautiful house for your wedding reception, possibly using a website like Airbnb. You have to get explicit permission from the host, but if they’re happy for you to go ahead then you’ve got a whole house and garden to yourself for your big day, and you could book it out for the previous night too so you can get ready at your leisure. Seating your guests at tables and serving them a traditional three course meal is both pricey and old-fashioned. Serve a delicious barbecue or hog roast. If your venue allows you the option to self-cater, consider hiring a company that will serve a delicious barbecue, hog roast, or whole roast lamb. Or, choose an even cheaper option: one of my favourite wedding breakfasts was a picnic consisting of lots of dishes contributed by the guests. We ate homemade sausage rolls, salads and homebaked cakes while sitting on the grass. Save money on wedding favours by making your own. Customise teacups with your guests names and use them as place settings, and then fill them with homemade biscuits, sweets or fudge for your friends and family to take home. Aldi’s Veuve Monsigny Champagne has been causing a bit of a stir. Priced at £10.99 a bottle, the bubbly is less than a third of the price of Veuve Clicquot but it’s won a clutch of awards for its excellent flavour and it flew off the shelves over Christmas. Other own-brand Champagnes incluing the Co-Operative’s Les Pionniers NV have also fared well in taste tests, so forget the fancy labels and head to your local supermarket instead. The little things can quickly add up, so save money on glassware by making use of the Waitrose free glass hire service. You can borrow wine glasses, goblets and Champagne flutes without paying a penny, but tell your guests to be careful as you will have to pay for any breakages. If the price of a professional photographer is beyond you, you could ask your friends to help you record the day instead. Enlist the help of a snap-happy friend with a good DSLR, or put some disposable cameras on each table and you’re sure to get some interesting angles. You can also cut the cost of hiring a professional by getting a package that doesn’t include prints: some photographers will give you the digital versions of your photos on a CD or memory stick and you can then print a few of your favourites yourselves.